Gerard Stamp is steeped in the work of the East Anglian masters - leading his website with that fine quote from John Constable: "Painting is but another word for feeling." Agony can be another word for feeling, too. This artist's great hero is the harrowed John Sell Cotman, in whose sublime pictures any sign of strain and struggle is magically erased. Back in 1811 Cotman set out to etch "all the ornamented antiquities in Norfolk" and Stamp has started to trace those distant footsteps across a landscape of monuments and ruins. The result is a sequence of delicate, exquisite and wholly distinctive images. 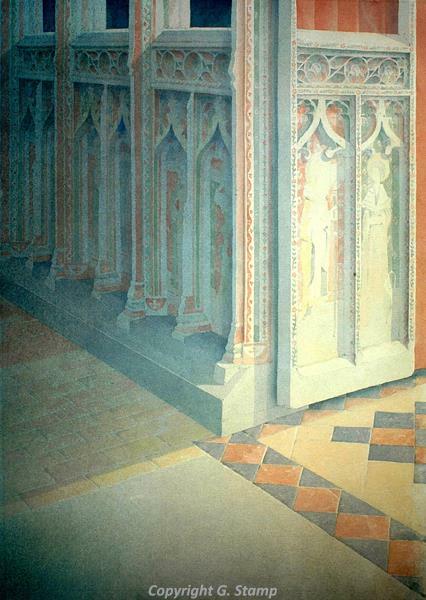 Gerard Stamp has also been inspired by Castle Acre Priory and the churches of Hales, Salle and Tilney St Lawrence.